Dental implants, Implant periapical lesion, Apicoectomy. Implant periapical lesion (IPL), apical peri-implantitis or retrograde peri-implantitis is described as an inflammatory lesion involving the apical part of a dental implant [1,2]. IPL is three times as frequent in the maxilla as in the mandible ; its incidence is low, ranging from 0.26% to 9.9% [4,5]. It may interfere with osseointegration, and progression of the lesion may be responsible for implant failure . IPL is diagnosed by clinical and radiographic examination. It has been described as a radiolucent lesion involving the apex of the dental implant . The clinical signs of active IPL include intense pain, inflammation, percussion pain and mobility [7-10]; signs of infection may also be observed, such as the presence a fistula in the soft tissue covering the implant, discomfort in the region of the implant, or the presence of purulent material . Reiser et al. classified implant periapical lesions in two groups: inactive form (not infected) and active form (infected) . When the X-ray results are not associated with clinical symptoms, the lesion is considered inactive, and treatment is not necessary so long as the implants remain stable in periodic follow-ups. Active lesions (infected) are expansile, grow over time and are generally accompanied by clinical symptoms [1,6]. The etiopathogenesis of an active IPL is multifactorial . An active IPL may be caused by bacterial contamination, premature load leading to bone micro-fractures before a proper bone-implant interface has become established, or by residual osseous cavities created by the installation of implants which are shorter than the prepared osteotomy site [1,10,13]. According to Sussman et al., the most likely cause of IPL is endodontic pathology of the natural tooth at the implant site (or an adjacent tooth) [14,15]. The aim of this study is to report a case of implant periapical lesion associated with the presence of a residual root fragment of a deciduous tooth. Apicoectomy was carried out on the implant. A 31-y-old patient with no relevant systemic disease, collaborator, allergic to penicillin, non-smoker was considered. Intra-oral examination showed multiple amalgam restorations in good condition; #13 was absent due to dental agenesis. The patient attended a dental clinic because she wanted to replace the missing tooth with an implant. She reported having lost the temporary tooth for one year. The initial Cone-beam Computerised Tomography (CBCT) image showed an edentulous area in the #13 zone with vestibule-palatal distance of 9.7 mm and length 16.3 mm, measured at the alveolar ridge, and the presence of a fragment of the deciduous tooth (Figure 1). 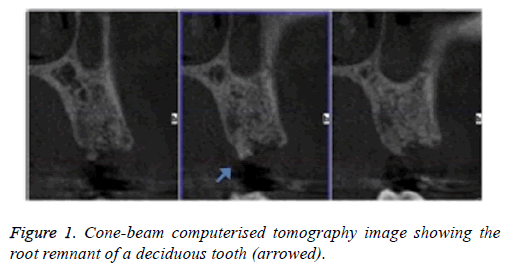 Figure 1: Cone-beam computerised tomography image showing the root remnant of a deciduous tooth (arrowed). Infiltrative anaesthesia was performed, a supracrestal incision was made and a full-thickness flap raised; the small root fragment, approximately 3 mm, was removed; the drilling protocol was performed and an implant 4.0 × 13 mm amplified was installed with torque 50 NW. The implant was left submerged. The patient was medicated with erythromycin 500 mg, 3 times daily for 7 d.
20 d after surgery, the patient attended at the dental clinic with acute pain at the implant site. Intra-oral examination showed an indurated elevation in the apical area of #13. A semilunar flap was raised and the loss of vestibular plate could be seen. The implant apex was observed, a granulomatous lesion was removed and the bone cavity was curetted. Gauze impregnated with chlorhexidine was applied, and two hemostatic sponges. The flap was repositioned and sutured, and the antibiotic was changed to azithromycin 500 mg daily for 3 d.
4 months later the patient attended for a check-up. A periapical x-ray was taken and the lesion, now 6 mm in diameter, was observed to persist. In clinical examination the vestibular area of #13 was observed to be indurated and asymptomatic. The periapical x-ray showed a radiolucent lesion surrounding the apical region of the implant (Figure 2a); its size was determined as approximately 7 × 5 mm by CBCT. Figure 2: (a) Periapical X-ray showing a radiolucent lesion surrounding the apical region of the implant; (b) A fistula is observed during the prosthetic phase of treatment in the region between #13 and #14; (c) X-ray image of the introduction of a gutta-percha cone into the fistula by catheter, reaching the apex of the implant. A further surgical procedure was carried out in which the area of #13 was anaesthetised and then a semilunar incision was made and the full thickness of the flap was raised. There was no need to approach the injury by a bone window as we raised the flap directly over the lesion. We proceeded to remove a granulomatous lesion, performed curettage in the apical bone cavity, and applied detoxified gauze soaked in 0.12% chlorhexidine. Using the latest technology, an autologous graft was taken with auto chip maker; the bone chip was positioned in the defect and covered with PRF membrane. The wound was sutured with 4.0 silk. A 3 mm healing abutment was used for connection to the implant. The fixation of the implant was checked; no mobility was found and it presented a dry sound under percussion. At check-up 7 d after surgery, the suture was removed and no vestibular inflammation was observed. The area was asymptomatic. A 5 month period was determined for observation/healing, with check-ups conducted by telephone, before rehabilitation started. We made a temporary tooth that helped to expand the diameter of the mucous. Conventional steps were then followed to install the crown, however in the step to test the metal structure an apical fistula was observed between #13 and #14 (Figure 2b). We took a periapical x-ray, introducing gutta-percha through the hole in the fistula (Figure 2c) to allow the origin of the injury to be shown safely. This xray showed that the origin of the fistula was again a radiolucent lesion at the apex of the implant. Clinically it was painless. The implant was stable without any mobility. A further surgical procedure was carried out (Figure 3). A semilunar incision was made in the vestibular area of #13 and the full thickness of the flap was raised. The granulomatous lesion was debrided, the apex of the implant was cut with a carbide cutter pan, (always with profuse irrigation) and a degranulation burr kit was used (2.5 mm diameter, EK Solutions, Israel) to clean the inner surface of the cavity and avoid leaving granulation tissue in the bone (Figures 3a-3i). The wound was washed with saline solution, and then gauze impregnated with tetracycline was applied for approximately 2 min (Figures 3j and 3k). Xenograft of bovine medullary bone, particle size 0.2-1 mm (OCS-B Korea NIBEC), was positioned in the cavity and covered with collagen membrane (Figure 3l and 3m). The flap was repositioned with discontinuous sutures 5.0 (monofilament polyamide 5-0 Dafilon® BRAUN, Aesculap) (Figure 3n and 3o). Figure 3: Description of the surgical procedure. (a) Semilunar incision at the mucogingival line, extending from #13-#14; (b) A granulomatous lesion is observed in the tissue adhering to the internal face of the flap; (c) The lesion is observed perforating the vestibular plate; (d) Elimination of the granulomatous tissue with alveolar scoops; (e) Removal of the granulomatous lesion with hemostasis pincers; (f) After removal of the granulomatous tissue, the apex of the implant is observed; (g,h) Resection of the apical portion of the implant is carried out with a tungsten carbide burr for straight hand piece under irrigation with physiological solution; (i) Conditioning the cavity with 2.5 mm degranulation burrs (EK Solutions, Israel); (j) Confirming that the cavity is free of granulation tissue; (k) Gauze soaked with tetracycline and physiological serum is introduced into the bone cavity for 2 min; (l) After this period, the cavity is irrigated profusely with physiological serum; (m) The cavity is filled with medullary bovine xenograft, particle size 0.2-1 mm (OCS-B, Korea, NIBEC); the filled defect is then covered with collagen membrane 25 × 15mm (Guidoss, Korea, NIBEC); (n) Synthesis with discontinuous monofilament polyamide 5-0 suture (Dafilon® BRAUN, Aesculap); (o) Patient check-up 22 d after surgery. Indications were given to the patient and a periapical X-ray was taken immediately for control purposes (Figure 4a). One month after surgery, the screw-fixed prosthesis was removed and the ISQ (implant stability quotient) was measured by Ostell; the value obtained was 76, which is compatible with optimum osseointegration. Figure 4: (a) Periapical X-ray in post-operatory check-up immediately after apicoectomy; (b) Cone-beam computerised tomography image 3 months after surgery. Three months after the apicoectomy, CBCT was carried out at check-up and continuity of the vestibular plate was observed, with absence of peri-implant radiolucency; the sinus membrane was healthy (Figure 4b). The patient was monitored for 24 months, during which time she was examined clinically and by x-ray. No signs or symptoms of infection were observed. Figure 5 shows the clinical and imagenological (CBCT) aspects 27 months after the surgery. 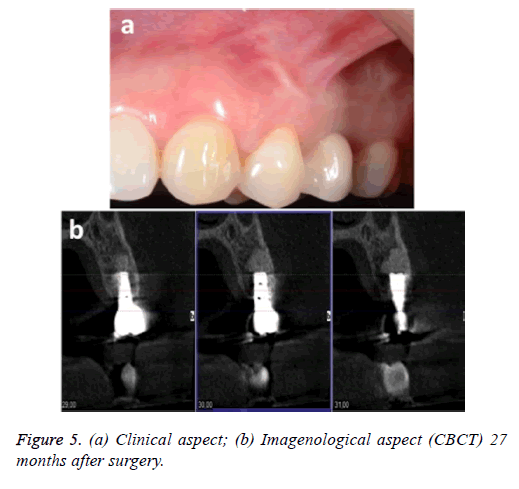 Figure 5: (a) Clinical aspect; (b) Imagenological aspect (CBCT) 27 months after surgery. IPL is a rare complication and a possible cause of premature failure of the implant. Our case involved the region of the upper left second premolar, corroborating Park et al., who state that IPL affects maxillary implants more than mandibular, predominantly in the premolar region . The clinical signs associated with the x-ray findings provide information on IPL diagnosis . IPL may be characterised by suppuration, formation of fistulas and loss of alveolar bone, however pain and fistula formation may not always be present [2,5]. An infection installed in the apex of the implant may be propagated to coronal, proximal, lingual and vestibular, and may thus destroy the osseous interface of the affected implant, as well as leading to insertion loss of adjacent teeth and/or implants [5,18]. In our case the patient presented acute pain and inflammation at the implant site 20 d after the surgery when the implant was originally installed; the first periapical surgery was carried out. Four months after the first periapical surgery, a hard, asymptomatic augmentation was observed in the region; in periapical x-ray a radiolucent lesion was observed surrounding the apical region of the implant with a dry sound under percussion. The second periapical surgery was carried out. Five months after the second periapical surgery, the presence of a fistula was observed clinically, while in x-ray a radiolucent lesion was observed in the apex of the implant; the patient did not report any pain and the implant was stable and with no mobility. Implant-plasty was carried out, removing approximately 5 mm of the apical portion of the implant; the zone was filled with bovine xenograft and covered with collagen membrane. This treatment was successful after 27 months' monitoring. Implant survival after IPL diagnosis and treatment is 96.2% . Chang et al. reported that IPL can only be treated successfully with systemic medication . Peñarrocha-Diago et al. reported that antibiotics administration is insufficient to resolve IPL [2,19]. Peñarrocha-Diago et al. reported 7 cases of IPL ; none of these cases responded to treatment exclusively with antibiotics, and periapical surgery with curettage and irrigation was necessary. These authors report that one week after periapical surgery the pain and inflammation diminished, and after one year all 7 implants remained functional in the mouth, without alterations observed by clinical or x-ray examination . Ayangco et al. carried out periapical surgery and applied tetracycline in the region for 1 min, for local disinfection; treatment was successful in three cases of IPL after failed endodontic and apicoectomy procedures . In the present case we observed that the lesion was active and capable of rapid expansion; antibiotics were administered, then periapical surgery was carried out with curettage of the granulomatous tissue. This was followed by application of gauze impregnated with chlorhexidine, PRF and autologous bone to the region. However treatment was not successful and it was subsequently necessary to eliminate the part of the implant involved in the lesion (apicoectomy), maintaining the osseointegrated part of the implant and filling with xenograft and collagen membrane. Our findings corroborate the study of Balshi et al., who stated that apicoectomy of the implant is a safe procedure for maintaining an implant with an apical lesion, providing stable osseointegration with no further complications . In a literature review, Romanos et al. found that out of 32 reported cases of IPL, apicoectomy of the implant was carried out in 3 cases to gain access to the walls of the defect and allow complete debridement ; however in one of those cases the implant failed after apicoectomy. Other authors stress the importance of surgical debridement or the removal of sources of infection, including contaminated implants and apical lesions [17,22]. Buhara et al. reported two clinical cases of implant failure due to IPL ; in both cases they decided to remove the implant and carry out very careful debridement in order to stop the rapid progression of the lesion and prevent damage to vital structures, promoting a definitive cure and resolving the patients' continuous pain. It is important to treat the lesion before it extends to coronal, since once it reaches the part of the implant with the internal screw thread; apicoectomy of the implant is no longer possible since there may be a channel providing communication between the oral cavity and the bone, which will permit bacterial migration . Peñarrocha- Diago et al. also state that diagnosis must be established quickly in order to treat lesions at an early stage, thus avoiding the need to extract the implant . The etiology of IPL is controversial. It may be caused by bacterial infection due to the remains of extracted natural teeth, overheating of the bone during preparation of the osteotomy site for the installation of long implants with external irrigation, bone micro-fractures caused by micro-movements (overloading), or residual bone cavities created by the positioning of implants which are shorter than the prepared osteotomy site [1,23-26]. Some authors suggest that the most likely cause of lesion is residual infection from the apical endodontic pathology of the adjacent natural tooth or teeth prior to extraction . Other authors consider that a possible cause of IPL is poor bone quality, which might have a negative effect on the formation of mineralised tissue around the implant [1,7]. According to Quirynen et al. the majority of IPLs reported in the literature occur in the maxillary region, where the bone quality tends to be poorer [15,16,19]. We agree with Piattelli et al. when they say that the origin of IPL is multifactorial ; in our case there was a 3 mm remnant of root at the implant site, and we believe that this was the determining factor for the development of IPL. The implant was in the maxilla, where the bone quality is known to be poorer and in the premolar region which presents higher prevalence of this type of lesion [1,7,19]. Both these circumstances may also have contributed to the development of IPL. IPL is a rare pathology which may lead to failure of the implant. Many premature failures can probably be explained by incorrect surgical technique . Careful planning, careful handling of contaminants and the use of irrigation systems during perforation of the bone to avoid overheating during implant installation surgery all help to prevent IPL [1,17,20]. Reiser GM, Nevins M. The implant periapical lesion: etiology, prevention, and treatment. Compend Contin Educ Dent 1995; 16: 768-772. Peñarrocha-Diago M, Boronat-Lopez A, García-Mira B. Inflammatory implant periapical lesion: etiology, diagnosis, and treatment-presentation of 7 cases. J Oral Maxillofac Surg 2009; 67: 168-173. Friberg B, Jemt T, Lekholm U. Early failures in 4,641 consecutively placed Branemark dental implants: a study from stage 1 surgery to the connection of completed prostheses. Int J Oral Maxillofac Implants 1991; 6: 142-146. Esposito M, Hirsch J, Lekholm U, Thomsen P. Differential diagnosis and treatment strategies for biologic complications and failing oral implants: a review of the literature. Int J Oral Maxillofac Implants 1999; 14: 473-490. Balshi SF, Wolfinger GJ, Balshi TJ. A retrospective evaluation of a treatment protocol for dental implant periapical lesions: long-term results of 39 implant apicoectomies. Int J Oral Maxillofac Implants 2007; 22: 267-272. Dahlin C, Nikfarid H, Alsén B, Kashani H. Apical peri-implantitis: possible predisposing factors, case reports, and surgical treatment suggestions. Clin Implant Dent Relat Res 2009; 11: 222-227. Scarano A, Di Domizio P, Petrone G, Iezzi G, Piattelli A. Implant periapical lesion: a clinical and histologic case report. J Oral Implantol 2000; 26: 109-113. 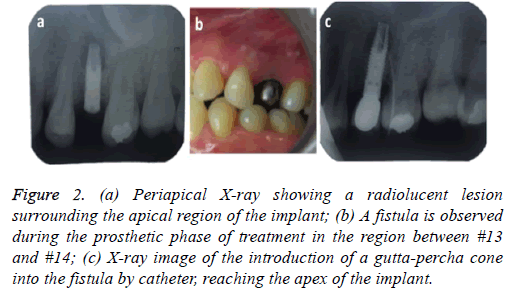 Oh T-J, Yoon J, Wang H-L. Management of the implant periapical lesion: a case report. Implant Dent 2003; 12: 41-46. Piattelli A, Scarano A, Balleri P, Favero GA. Clinical and histologic evaluation of an active implant periapical lesion: a case report. Int J Oral Maxillofac Implants 1998; 13: 713-716. Temmerman A, Lefever D, Teughels W, Balshi TJ, Balshi SF, Quirynen M. Etiology and treatment of periapical lesions around dental implants. Periodontol 2014; 66: 247-254. Al Ghamdi AST. Successful treatment of early implant failure: a case series. Clin Implant Dent Relat Res 2012; 14: 380-387. Rosendahl K, Dahlberg G, Kisch J, Nilner K. Implant periapical lesion. A case series report. Swed Dent J 2009; 33: 49-58.
van Steenberghe D, Yoshida K, Papaioannou W, Bollen CM, Reybrouck G, Quirynen M. Complete nose coverage to prevent airborne contamination via nostrils is unnecessary. Clin Oral Implants Res 1997; 8: 512-516. Sussman H. Implant pathology associated with loss of periapical seal of adjacent tooth: clinical report. Implant Dent 1997; 6: 33-37. Quirynen M, Vogels R, Alsaadi G, Naert I, Jacobs R, Steenberghe D van. Predisposing conditions for retrograde peri-implantitis, and treatment suggestions. Clin Oral Implants Res 2005; 16: 599-608. Park S-H, Sorensen WP, Wang H-L. Management and prevention of retrograde peri-implant infection from retained root tips: two case reports. Int J Periodontics Restorative Dent 2004; 24: 422-433. Buhara O, Uyanık L, Ayali A, Aydin M. Active implant periapical lesions leading to implant failure: two case reports. J Oral Implantol 2014; 40: 325-329. Sussman HI, Moss SS. Localized Osteomyelitis Secondary to Endodontic-Implant Pathosis. A Case Report. J Periodontol 1993; 64: 306–310. Romanos GE, Froum S, Costa-Martins S, Meitner S, Tarnow DP. Implant periapical lesions: etiology and treatment options. J Oral Implantol 2011; 37: 53-63. Chang L-C, Hsu C-S, Lee Y-L. Successful medical treatment of an implant periapical lesion: a case report. Chang Gung Med J 2011; 34: 109-114. Ayangco L, Sheridan PJ. Development and treatment of retrograde peri-implantitis involving a site with a history of failed endodontic and apicoectomy procedures: a series of reports. Int J Oral Maxillofac Implants 2001; 16: 412-417. Sussman HI. Periapical implant pathology. J Oral Implantol 1998; 24: 133-138. McAllister BS, Masters D, Meffert RM. Treatment of implants demonstrating periapical radiolucencies. Pract Periodontics Aesthetic Dent 1992; 4: 37-41. Mombelli A. Etiology, diagnosis, and treatment considerations in peri-implantitis. Curr Opin Periodontol 1997; 4: 127-136. Eriksson R, Adell R. Temperatures during drilling for the placement of implants using the osseointegration technique. J Oral Maxillofac Surg 1986; 44: 4-7. Meffert RM. Periodontitis and peri-implantitis: one and the same? Pract Periodontics Aesthetic Dent 1993; 5: 79-82.